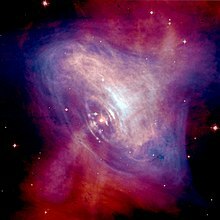 The predominant theory to account for the missing mass of the Crab Nebula is that a substantial proportion of the mass of the progenitor was carried away before the supernova explosion in a fast stellar wind, a phenomenon commonly seen in Wolf–Rayet stars. However, this would have created a shell around the nebula. Although attempts have been made at several wavelengths to observe a shell, none has yet been found. Very rarely, Saturn transits the Crab Nebula. Its transit on 4 January 2003 (UTC) was the first since 31 December 1295 (O.S. ); another will not occur until 5 August 2267. Researchers used the Chandra X-ray Observatory to observe Saturn's moon Titan as it crossed the nebula, and found that Titan's X-ray 'shadow' was larger than its solid surface, due to absorption of X-rays in its atmosphere. These observations showed that the thickness of Titan's atmosphere is 880 km (550 mi). The transit of Saturn itself could not be observed, because Chandra was passing through the Van Allen belts at the time. ^ a b Green, David A.; Stephenson, F. Richard (2003). Weiler, K. W. (ed.). The Historical Supernovae. 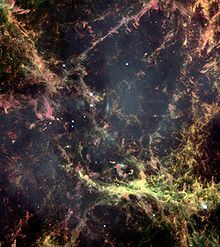 Supernovae and Gamma Ray Bursters. Lecture Notes in Physics. 598. Berlin: Springer. pp. 7–19. arXiv:astro-ph/0301603. Bibcode:2003LNP...598....7G. doi:10.1007/3-540-45863-8_2. ISBN 978-3-540-44053-6. ^ Rossi, Bruno Benedetto (1970). 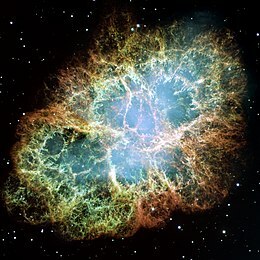 "The Crab Nebula. Ancient History and Recent Discoveries". In Conversi, M. (ed.). Evolution of Particle Physics. Academic Press. p. 237. ^ Setti, Giancarlo (2012). "Franco Pacini (1939–2012)". Bulletin of the American Astronomical Society. 44: 011. doi:10.3847/BAASOBIT2012011 (inactive 11 March 2019). ^ Nomoto, K. (January 1985). "Evolutionary models of the Crab Nebula's progenitor". The Crab Nebula and Related Supernova Remnants: Proceedings of a Workshop Held at George Mason University, Fairfax, Virginia, October 11-12, 1984. Cambridge University Press. pp. 97–113. Bibcode:1985cnrs.work...97N. ISBN 0-521-30530-6.